The various Web sites report that law enforcement officers have stopped responding to calls in the canyon and instead advise nervous neighbors who hear strange sounds to just close their windows and wait until morning. That’s the Internet legend. The reality is very different. Reno Police Department spokesman Steve Frady and Deputy Chief Jim Johns said the stories about the canyon “sound like hoakum.” And as for police avoiding the area, “(residents) call, we go,” Johns said. Neither police nor the Reno Gazette-Journal newspaper archives have any record of bloody mayhem in Robb Canyon in the 1970s or any other time. The canyon’s reputation in cyberspace came as a shock to nearby residents interviewed by the RGJ last week. “Wow, that’s really weird; it’s a surprise to me,” said Mike Montalbo, who for 17 years has lived on Backer Way above the copse of aspen trees that ghost hunters have described as one of the canyon’s hot spots for supernatural experiences. “It’s news to me. I’ve never heard any noises or anything like that except for coyotes,” he said. Montalbo said he can confirm the “cold spots” along the canyon path near Rainbow Ridge Park. Other neighbors, who have lived in the area between three and 20 years, also said they had no idea the canyon was supposed to be haunted. The various Web sites list paranormal research groups and individuals who reported suspected supernatural events in the canyon. None of those sources, when they could be tracked down, returned phone calls and e-mails from the RGJ last week. Still, people who read the Internet reports often go to the area to see for themselves. Cate Barrett, 28, of Sparks, said she and a friend hiked down the canyon just before sunset one day in May. She said they had read the blog accounts of the area and were prepared to be scared. She said she wasn’t really expecting a ghostly encounter. 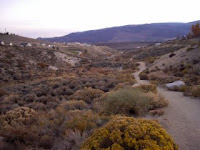 In the early 1970's the mutilated bodies of a woman and 3 men were unearthed in this, at the time, remote high desert canyon in west Reno. To this day, the murders have not been solved, and several visiting psychics feel the dead may be attempting to engage the living to solve their gruesome murders. Currently the canyon sits below a city park, and the mesa-top high above is speckled with houses. Over the years, residents have reported seeing strange lights and hearing very disturbing sounds, including a bloodcurdling scream, that "you will never forget for the rest of your life" echoing up the canyon. Although many long time residents of the area are reluctant to talk about what they have experienced, it is hard to not find someone without a personal account of paranormal activity. Although many other west Reno parks are crowded in summer evenings; you will never see any one in here after sunset. Reportedly, both the Reno Police Department and Washoe County Sheriff's office no longer respond to calls to investigate the disturbances in the canyon, and often say "just close your window and stay out of that canyon at night". When paranormal investigators enter the canyon, they are hit with an immediate and overwhelming feeling of dread and fear, causing many "premature" endings to their investigations.